If you are on Windows 7 or Windows 8.1, and you are having the problem that ur CPU is at 100% utilization or high CPU usage, then You can easily fix the issue by following those steps. First look for the processes that is causing the problem in this case it is (svchost.exe) using high CPU usage, and it doesn’t seems to reduce/stop even after some time. 2) Under Processes, sort all the program by CPU utilization by clicking on CPU tab Processor. 3) Look for (High CPU usage) processes (svchost.exe). Right click on the svchost.exe > Go to Service(s). 4) Now, it will highlight the services linked to the selected svchost.exe. 5) In Task Manager, under Services tab, click on Services… button at the right bottom of the window. 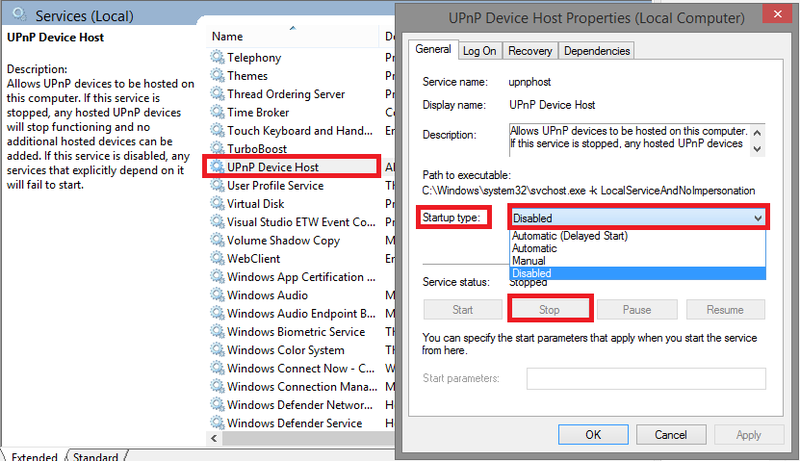 6) Look for uPnP Device Host, then right click on it > Properties. 7) In the drop down menu for Startup Type, choose Disabled . Then click OK. And you can quit Services window after it is disabled. If there would be risk in disabling this process? UPnPhost service simply looks for devices such as printers, scanners and such that are on a network for your computer to connect to. if your not on a network then you don’t need it or enable it on the time when You need it again by going to the services and click on start.